In the past, when the students stood up, nothing was able to hold them back. General Zia‘s ban on student unions in 1984 was akin to demolishing all medical colleges in the country and then bemoaning the fact that Pakistan lacks capable doctors. If you ban medical colleges, the doctors who will serve you are likely to be quacks, armed with fake degrees and no real desire to help those whom they profess to serve. Student unions are the nurseries of leadership. They hold debates between students from opposing parties. This helps create tolerance for differing viewpoints and helps students learn the ‘agree to disagree’ approach. Regular, annual elections are held that teach students how to campaign and build a support base. Often, coalitions are formed between groups from different parties such as the Progressive Students Alliance (PSA) and the United Students Movement (USM). This teaches compromise. Students learn the power of a vote and leaders learn that they must be humble or face a rout in the next elections. The youth is the future of Pakistan. If they do not learn the basics of mature politics, how can you expect individuals of high calibre to appear in the politics of the country? The disillusionment of the post 1984 generation with politics is another effect of the good General’s ban. Students have become cynical and pessimistic. Many are not culturally, socially or politically aware. The power of the students has been broken. And there are pertinent reasons for this. In the past, when the students stood up, nothing was able to hold them back. It is doubtful that Pakistan would have been formed without the passionate young scholars of Aligarh College. Ayub Khan’s government was toppled by students who were at the forefront of the anti-dictatorship movement in 1968. Steps were taken to categorically dismantle and break their power, especially of progressive, leftist student parties like the National Students Federation (NSF). This left the field open to conservative, Islamist parties who imposed their myopic ideologies on student bodies throughout the 80s. An interesting thing to note here, especially for sceptics who believe that student politics results only in violence is that more students were killed after the ban on student politics than before. This is expected when one realises amount of energy contained in youth. It can be expressed constructively though vigorous debate and election, or through an AK-47. An article published in the New York Times on August 28, 2010 refers to how, traditionally, Pakistani politic remained the domain of a few members of the landed class. This is again courtesy of the ban on student unions. When you stop a whole generation from entering the political arena, who will fill that gaping void? Sons of feudal landlords come to mind. This is how the tradition of dynastic politics began. A frequent question students ask is how we can get rid of dictatorial heads of political parties? How will we change the corrupt system? When passionate, determined students enter politics, they can change the system by keeping true to their principles of integrity. Most importantly, they can take charge of Pakistan and, with the help of an independent judiciary and a free media help Pakistan face all her problems in a mature, solution-oriented way. An A’ Level student at Karachi Grammar School, Shahzeb makes no apologies for being a passionate advocate of democracy and tolerance. He blogs at shahzebnajam.wordpress.com. A good awakening of the time! But there are several many factors other than General Zia’s ban which hinder the passion to stand, to strive and to survive. Most importantly the negative taking of technology by the youth, is perhaps a big factor. The writer has written well, but as he is too young and is not aware of the negative side of the students union. I joined college back in 1987 in Karachi. Though in reality there was no ban in the college and university on student unions. Every political party used to try and bring the new entrants in their fold. There was more politics, more violence, more killings and less academic activity in those years. The students who were young wasted their time and money and eventually their career suffered,academic schedules also suffered because of disruption.The students ended nowhere. They lost their lives and many were seriously injured in shootings and beatings of clashes between different political parties students wing. Nobody goes to college or university to become a politician. If those who desire to enter politics, must first complete their studies, and then think of future in politics. Countries like Japan,China,Singapore,Canada,UK,USA,Germany etc did not become great nations by encouraging politics on their colleges and universities campuses!! !.It’s a great myth that because there is no students union/ ban on student politics in Pakistan, Pakistan is suffering and only feudals are coming in the power. For matter of fact almost all Pakistani rich and feudal send their sons and daughters to best colleges and universities in the west not because they want them to learn politics!!!!. This rhetoric of ban on students union has been spread by those who want to fool the current young people who are not aware of the facts. They want to destroy the careers of the common Pakistani’s by making them walk away from their path/career,so that their sons and daughters who are educated in west can come back and rule them easily. It’s time to wake up and not to be fooled by this rhetoric of ban on students union. @Asad: * Countries like Japan,China,Singapore,Canada,UK,USA,Germany etc did not become great nations by encouraging politics on their colleges and universities campus All these countries have had a vibrant student political culture apart from say Singapore. The Chinese Communist Party has used students as the vanguard of social and economic change. While the Western countries you mention have ushered in eras of progressivism, may it be the end of discrimination against black people in the US, allowing women to vote in Great Britain in the 1920’s, student protests in 1968…. you dont need to go back that far, look at the strong student protests against the hike in student fees in the UK today. All these countries you mention, most of the political elite were active first in student politics and then progressed into national politics. Student politics allows for one to develop an appreciation for issues that concern oneself and society at large. Calling for students to be apolitical and focus on their careers is will and good, but that nurtures individualism and alienates one from wider society. You say that people dont focus on their careers? But then what off the people who want to have political careers or be active in civil society? Do you think that young people are so easily swayed that they cannot complete their studies and have a political view at the same time? Its easier said than done Nadir. Politics in Pakistan is completely different to that of west. In west students union are for different purpose.Pakistan has hardly 20-30 percent literacy rate.Please don’t get confused with official figures.Its high time we realise that Pakistan has different environment than west. Lets first get education and compete with developed nations even India is way ahead of us in that and think about politics later.All the things which you are quoting happed at least more than 40 years ago.The world has changed so much.As I have gone through the education system in Pakistan I can easily say what is better or not whether people like it or not is an other matter.The truth is always bitter. Theoretically, I 100% agree with your viewpoint, but practically, in a country like Pakistan, we know how violent our political system is, and in order to maintain peace on the campuses, we can’t afford these unions. And the union members are used like tissue papers by our leaders. You very rightly mentioned that student unions produce leaders, same goes for the local bodies around the world, but not in Pakistan, local bodies have been around for quite sometime now, but no leader is produced, because our political parties are family business. @Asad: Just because they are not legal student unions does not mean that students will shun politics and concentrate on their studies. As their are no legal, proactive and constructive form of on campus debate students are either apolitical and removed from the reality of every day life or are swung to the other extreme where they are part of fringe, radicalised and often violent student groups. social debate is part of an educational process. Education is not just about attending classes and passing exams, that a defunct model of education which we continue to push for. Perhaps, part of the reason our educational system struggles is because avenues for personal development outside the classroom are limited. Whether there is legal sanction or not, people will highlight their opinions. If there are no constructive ways of articulating those opinions, constructive criticism will either be wasted and remain unheard, or the frustration of not being heard will push people towards more violent and intolerant groups. So another evil deed of Zia! Whenever I read some bitter reality of Pakistan, I come to know that every evil started in Zia’s rein. I really want to know how Pakistan and Pakistanis were before Zia. In my student life I did wish that there should be student unions which should work under some teacher of the institute regardless of any attachment with any political party. Uni life is the time to learn and excel in the field u chose and this is a fine medium to nourish yourself intellectually. Its not the right age to start boiling ur blood in politics. Also being a uni student, I can tell how extremely annoying the silly strikes are. I’d have to agree with Nadir and the Author here. While it Is important for people to focus on their studies, Pakistan badly needs more politically aware students and student unions could, if properly nourished and supported, be a way to increase that pitifully small number of kids with interests other than just their coursebooks. And its really not as though we’re not adult enough to be able to focus on both things at the same time. Agree with the author. Student unions are important and help develop leadeship for the society. 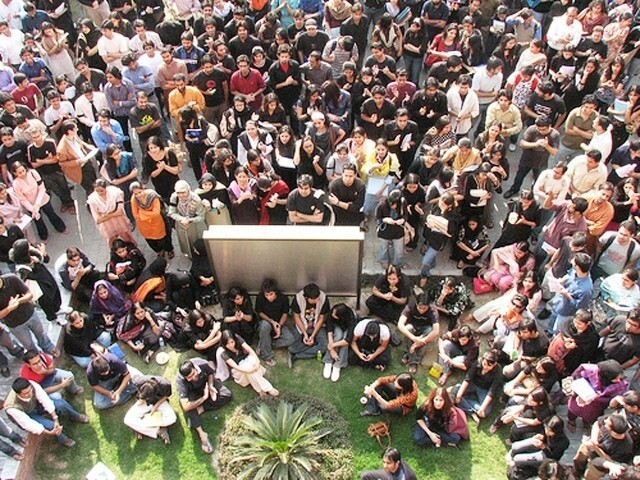 These student unions should be for students, not off shoots of political parties. I disagree (respectfully) We can choose to excel in our chosen fields and continue or hobbies it is called multi tasking. If we don’t boil our blood on these issues, then we should sit back and relax and let feudals come in and let it things progress from bad to worse. Everyone agrees students are the future yet, discourages them from going into the one field that we need the most improvement or complete overhaul in…Politics. This cycle of inheriting the country will continue unless educated people act. People here are again mixing student union with student organizations.. Student union is a representative body of students in any institute. It’s through these bodies students learn to organize themselves and work socially to solve issues. Students Union, in past, gave many leaders to the country; Islamist, secular, left and right. Students Union are the need of the hour otherwise the nation would have to endure the feudal lords, industrialists, wilayat palat bankers or street ghoondas. There was a time when ideological differences were debated and issues were solved using the platform of union. Since the ban on unions campus riots have increased resulting in more killings as students now don’t have a body of their own. Though in reality there was no ban in the college and university on student unions. Every political party used to try and bring the new entrants in their fold. There was more politics, more violence, more killings and less academic activity in those years. @Usman Mustafa Syed: Usman,Its easier said than done especially in Pakistan.All those who are saying that students union will change the environment are certainly not aware that the political parties student wing will not allow them any leverage at all.This is not the West.All those who are in favour of the students union probably have no experience of the things and are merely getting emotional.